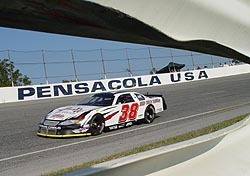 A lot of racers who race at Pensacola’s (FL) Five Flags Speedway will say that to be fast at the historic half-mile, you first have to be cautious. You have to be cautious and stay out of the wrecks. You have to be cautious and have a conservative pit strategy. And you have to be cautious with your tires and keep them for the end of the night. the time that the leaders were getting ready to take the white flag, Josh Hamner spun and hit the inside wall. The leaders took the white and raced to the checkers, or so they thought. 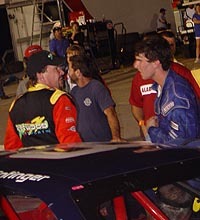 As Enfinger approached turn three, Hamner was righting his ride, along with Rocky Boyd, who also spun in the accident. Enfinger went high to get around Hamner as Mercer dove low. Mercer came to the line first, expecting to see checkers, but instead seeing the yellow. “We came down and took the white flag,” said Mercer. “The 82 car (Enfinger) was faster than me, but the fact remains that we took the white flag. I was up to his bumper. We were in turn one when the caution lights came on. My guys were yelling there was a big wreck. “Well, we came down the backstretch and the 38 car (Hamner) was spun. The 82 had to go up on the high side. I went to the bottom side and beat him to the line. That should have been to the checkers. If you take the white, you race back to the checkers. Grant was all smiles in Victory Lane, following his win in the final Blizzard Series race of the year. Race Director Dan Spence said he called for the caution before the cars took the white flag. In the time it takes to radio to the flagman of the caution flag and for the flagman to throw the yellow flag and turn on the caution lights, the leaders were well past the start / finish line. “He had a flag in his hand when we were supposed to be getting the white flag,: said Enfinger. “I can only see (the flagman) when I’m coming out of turn four. I don’t know if he was throwing (the caution) when we crossed the line or what, but I just kept going for it. When I got to turn three though, one car was going high and one car was going low. I about destroyed our car there by choosing to go around them high. I thought I was going to get into the wall big time. The third-place finish allowed Mercer clinch the Blizzard Series title. That was important, because the first two drivers in the Blizzard Series championship standings are guaranteed provisional starting spots in the December Snowball Derby at Five Flags. 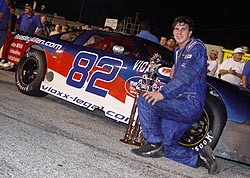 At the time of press, the second-place points finisher was still being determined, but was between Carlson and Ryan Crane. 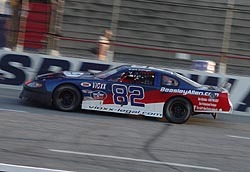 Enfinger's #82 took only a couple of laps in practice during the day. But in the end, the night belonged to Enfinger. And the victory was extra sweet, considering the team’s problems from Friday. “We had a ton of issues today,” said Enfinger. “Yesterday, we couldn’t get out of our own way. All we were doing was spinning tires. We changed a lot of stuff and went back to what we ran here last night. It worked out for us. out second. That was huge. All of my guys are volunteers and we’ve been practicing pit stops the last couple of weeks because we’ve struggled there. We had some problems before, but this ended all of those questions. It was a good race. It was good for Mercer. It was good for Carlson. But it is a night that will live with Enfinger forever. But there was “caution” of a different sort that helped Grant Enfinger win his first-career event at Pensacola on Friday night as the Blizzard Series (Super Late Model) came to a close. The race played out like most Five Flags Speedway races. Most of the teams ran conservatively early, saving their tires for the final 20-laps. All of the lead lap cars pitted with 30 to go for fresh right side rubber, and the race was on. Augie Grill came into the pits in the lead late in the event, but he came out fifth. Pole sitter Eddie Mercer went in second and came out first. Enfinger went in fourth and came out second. An accident just a few laps later took Grill out of the running and set up a Mercer-Enfinger showdown. On lap 85, Enfinger made his move, jumped to the inside and passed Mercer, the Blizzard Series points leader heading into the night, for the top spot. The field was then reset, putting Enfinger back out front and Mercer back to second for a final green-white-checker finish. This finish was much less exciting. Enfinger went unchallenged as Mercer fought and eventually lost second-spot to Scott Carlson. Mercer was upset about the call at the end of the race. But he was also quick to point out that the best car still won the event, and that was not his black #72. Scott Carlson finished second in the race.